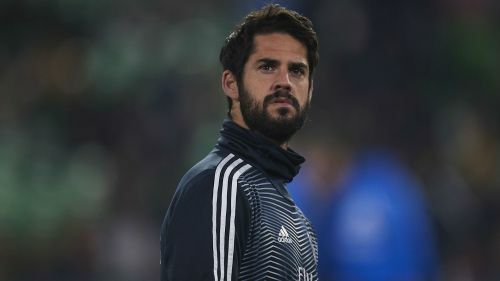 Isco is back in the Real Madrid squad for Saturday's Clasico clash with Barcelona after almost a month on the sidelines with back and neck pain. The Spain international has not been named in a matchday squad by Madrid since the first leg of their Copa del Rey semi-final with Barca on February 6, a 1-1 draw in which he was an unused substitute. The 26-year-old has still not started a league game since Santiago Solari was promoted to become the replacement for Julen Lopetegui, who coached Isco while in charge of Spain. But Isco could be selected for Saturday's meeting at the Santiago Bernabeu as Madrid seek to narrow the gap on LaLiga rivals Barca and make amends for their Copa exit. Wednesday's second leg between the sides saw Barcelona run out 3-0 winners at the Bernabeu with Luis Suarez scoring either side of an own goal by defender Raphael Varane. Barca have a seven-point lead from Atletico Madrid as Ernesto Valverde's men seek to defend their league title, while Madrid are a further two points off the summit. Kevin-Prince Boateng is the only notable absentee from the Barcelona squad named by Valverde for Saturday's trip to the capital. Arthur is in contention to make his return to the starting line-up after recovering a hamstring injury, the Brazil midfielder having come off the bench in the Copa contest. An El Clasico semi-final: What to expect from Barcelona and Real Madrid?